I’d rinsed every offering in my plug bag trying to get one of those silhouettes to eat. It was the last of a lagging flood tide in a tidal river near my home in Rhode Island, and some nice fish I’d presumed were stripers had lined up on the dark side of a shadow line thrown by a blinding white sodium light on the single-span concrete bridge. Small pods of mullet V-waked across the threshold into darkness while full-grown menhaden popped above the bridge. At random intervals, little clouds of white bait flashed through with the boiling tide. For two hours, I’d altered retrieves and carved up the whole stretch of river, swinging every plug and jig in my arsenal across that important shadow line from every angle and on every arc. At one point, I felt a faint bump and retrieved a rubber shad, minus its paddle tail. Like that, my bass had become bluefish. One replacement lure, then many other variations, came back fishless. 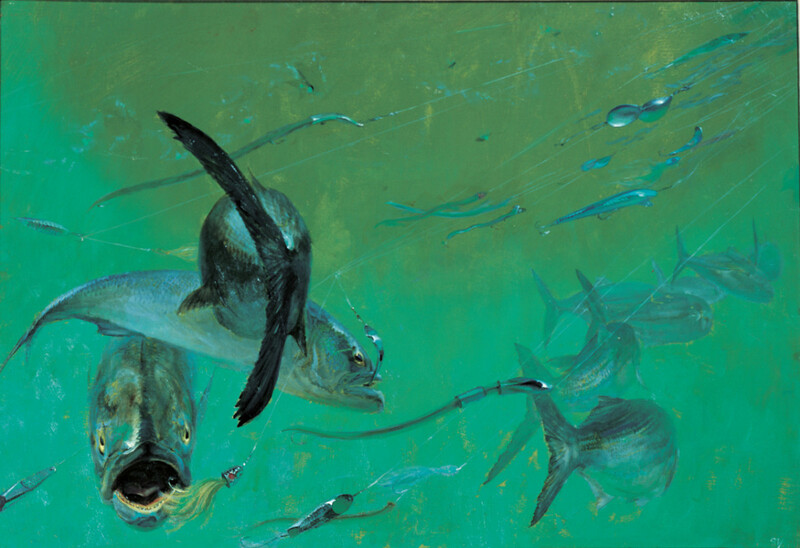 Blues and Sand Eels in the Surf by painter Stanley Meltzoff captures a wild feeding frenzy in the shallows. I paused. The river, a murky conveyor, coursed inland, indifferent. In desperation, I remembered the eel bucket in my trunk. I found one dead eel and manufactured a long, heavy leader, reasoning that the 100-pound mono nearest the hook might offset the way-too-light gear to which I’d connect it. Then I impaled my lone bait on a long-shank bait hook as further insurance against teeth. I marched well up-tide of the bridge, figuring if I got the angle right I could drop the eel just short of the far bank and just above the shadow line, then let it swing right across the nose of every predator hanging on that seam. I blew three casts, stumbled 10 feet closer to the bridge and finally lofted the bait toward my target. Hearing, not seeing, it land, I presumed I’d overshot my mark. I flipped the worn-out bail by hand and began to take up line to connect with my rig. Something felt off, and my synaptic autopilot intervened. I dropped the rod tip, tensed and set once, hard. Off the shoulder of the far bank, the river exploded. I heard it before the droplets shot into the artificial dawn. Her first run was straight down-tide, or upriver. The light rod bucked, and line surged against my jerky, ill-maintained drag. I clomped toward the bridge, hoping I’d stop the fish or change my angle before she reached the near-90-degree bend in the channel and hung me on the junction buoy. I’d just begun pleading with the fish under my breath — expecting the sickening ping of line parting — when she veered hard left toward the near bank. I cranked feverishly and regained a little line before she stopped dead. We locked in a tail-beating stalemate. I noted the channel marker had eased out of its full-tide lean and marveled that this fish could pull so hard without help from a couple knots of fair tide. For five honest-to-God minutes, she zigzagged bank to bank but wouldn’t relinquish a single foot of line. For one minute, I got her coming straight down the channel. Then she turned, rocketed back upriver to just short of the dreaded buoy, turned again, bolted from the channel depths to the far bank and leapt. My line went limp. I cranked, sure I’d lost her. I felt weight. She jumped again. And again. I stayed tight and prayed I could hang on. Eventually she ran back downriver into the weakening current, right past me and out into the blinding fluorescence. I fell twice scrambling over rocks. I fought that fish for just shy of 20 minutes — perhaps the longest I’ve ever fought a fish from shore. I was certain from the outset that she’d chafe through the leader or blow up my creaky reel. Somehow, everything held. When I finally grounded her, she was huge. I remembered a standing request from a neighbor for a smoker fish. Not that I would have released her, anyway — chalk that up to the long half-life of a boyhood obsession. After admiring my fish for a moment, I lugged her up to the car and laid my waders across the spare tire, the blue across the waders. When I got home, there was congealed blood in the tire well. Nothing to be done: To have bled her would have cost weight. A borrowed hand scale registered between the 18- and 19-pound hash marks. In nearly two decades of fishing for a living as a mate and deckhand, I’ve handled bluefish in numbers that would backlash an average angler’s head — literally tens of thousands of every conceivable size. I’ve stood in beamy boats shin-deep in blues. I’ve overseen nighttime deck sessions that felt nearer to trench warfare than sport fishing. I’ve settled pools where the top three fish for the boat cracked the 20-pound mark — real monsters. I’ve picked through panels of gillnet so loaded that there was a face in every window and lobbed hundreds of them out of big pens of rippling squid after autumn haul-backs on draggers. I’ve filled bait barrels while charter clients hauled full umbrella rigs with four hooks on permanent repeat. 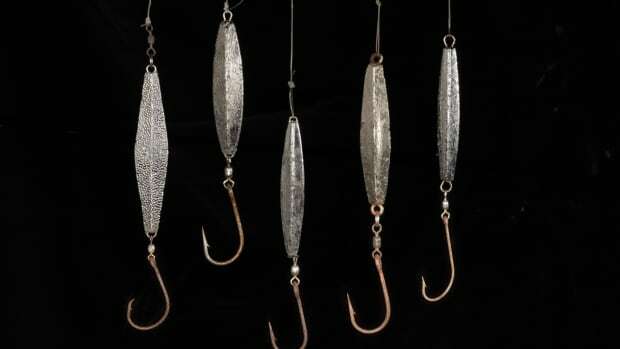 I’ve jigged, plugged, chunked, hand-lined, trolled and live-lined blues, bridle-rigged them and sent them up-slick in the hunt for big makos or threshers. I’ve slow-trolled them, and I’ve watched them skip along the surface beneath kites while giant-bluefin fishing. A bluefish is a force of nature, a fish engineered for adaptability, a vicious nomad, semipelagic and built for burst-speed. A scourge of any other species that will fit — part or parcel — inside its bite radius. A fish that lets you know its intentions the second you lay a hand on it: to free itself, then tear you to pieces. 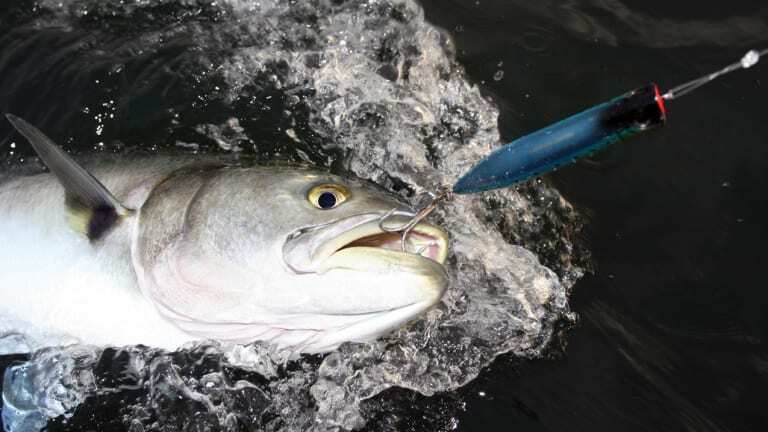 There’s a crisp, no-pretense honesty to a rod-and-reel transaction with a bluefish. When you put a hook in one, it’s like tethering yourself to a crack-addled junkyard dog. I admit I have a complex relationship with blues. I’ve slaughtered them for market and slaughtered them for sport. I’ve chummed them into fish-per-cast lunacy. I’ve cast for hours at hundreds of visible blues without drawing so much as a halfhearted swipe. I’ve meat-grindered them into chum buckets, and I’ve tagged them for science. I’ve kicked, billy-clubbed and punched bluefish, and at other times I’ve unhooked and released them with utmost care. 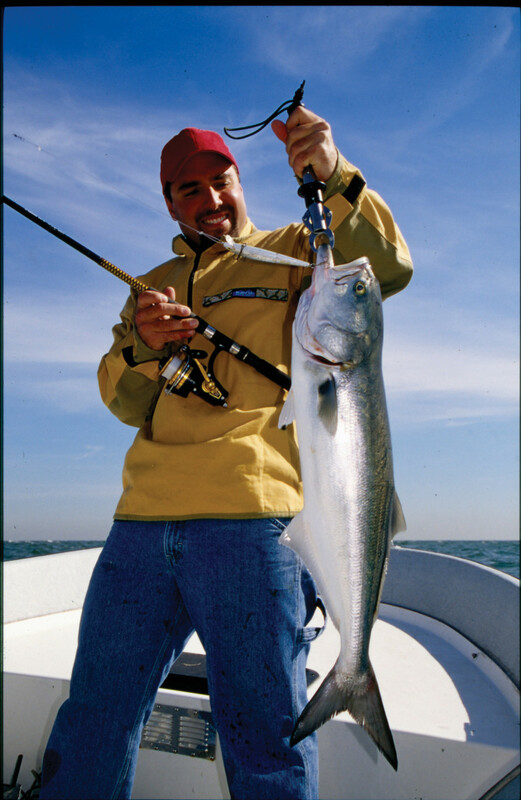 Aggressive sight-feeders with good speed, bluefish are popular with shore and boat anglers. I have celebrated and cursed, respected and abused bluefish. I am either the worst or the best guy to deliver a sermon on our much-maligned Pomatomus saltatrix. 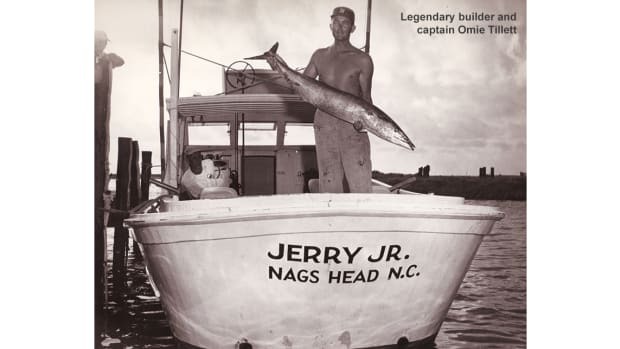 Twenty years ago, I could never have imagined any scenario that made an underdog of bluefish. Inconceivably, however, blues seem to have chomped their way into serious public relations trouble. As usual, the problem lives on the human side of the fishing equation. In this age of custom, more-faster everything, the angling public now wants to defy ecological gravity. It wants customized nature: bass, no blues. A child of the striped bass moratorium, I made my first semicoordinated attempts to catch fish during the years when the striper population ebbed to its low-water mark (roughly 1981 to 1985), with my age still safely in single digits. 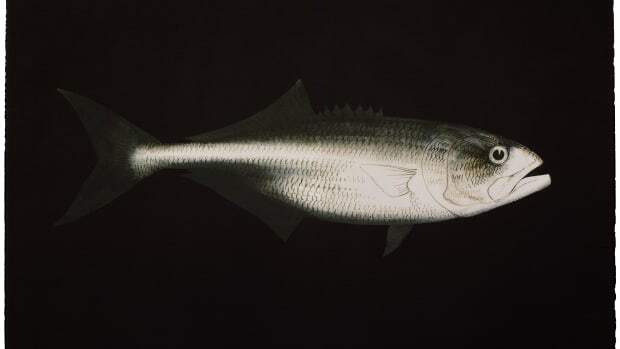 I had no notion that my home waters around Jamestown, Rhode Island, had ever harbored a single bass, so I had no remorse over what I’d missed. After a couple of years spent poring over two boxes of yellowed Saltwater Sportsman issues that my parents found at a yard sale, I could identify most game fish that supported viable fisheries circa 1980 — striped marlin, roosterfish, lingcod, amberjack, barracuda, giant trevally. But it was the fish within striking distance of my home in my own present tense — flounder, scup, tautog, sea bass — that whetted my appetite for time behind a reel. I knew my future would be worth its weight in 15- and 17-pound slammer bluefish. I read and reread John Hersey’s Blues and combed through other fish reading material, devouring anything I could turn up on the subject of bluefish. Armed with a hodgepodge of biological factoids and fish-writing sound bites, I snapped to attention every time I spied salt water from the backseat of our 1970s Mazda subcompact. I don’t believe I missed a single tern, gull, dimple, splash or patch of greasy-looking water belying the presence of adult menhaden around which my slammers would congregate. I maintained an open-ended watch for “blitzes,” during which, said all the magazines, slammers of 12 or even 20-plus pounds would corral large bodies of mossbunker/menhaden/pogies into coves, where they (the toothy, voracious slammers) would chop their oily prey to bits, slashing and veering and exploding along the surface, the only visible evidence of the mayhem below the telltale slicks, which, it was said, produced a scent not unlike that of “fresh-cut watermelon.” I read that bluefish also consumed other bait species — squid, herring, butterfish, mackerel, sand launce. One book I consulted frequently was American Food and Game Fishes, an antique among field guides and a throwback to the Great White Hunter period of sport fishing. It describes the bluefish as an “animated chopping machine,” a phrase that has been lodged in my prefrontal cortex for more than 30 years. Under the right circumstances, the bluefish is a precision-engineered mass murderer known for chopping and maiming until its belly is distended, firm as its forehead, then purging to free up space, resuming its bloody rampage. In my second act, as a professional fisherman and fish-writer, I’ve begun to consider, through the lens of observation, the myriad roles the bluefish plays in its ecosystem. Bluefish are unequaled agents of energy transfer, killing many times what they consume and carpeting the seabed with calories for cleanup crews representing every link of the food chain. They are incredibly resilient and adaptable, as suited to the hard living outside 30 fathoms as they are to the easy pickings along the high-season beach. 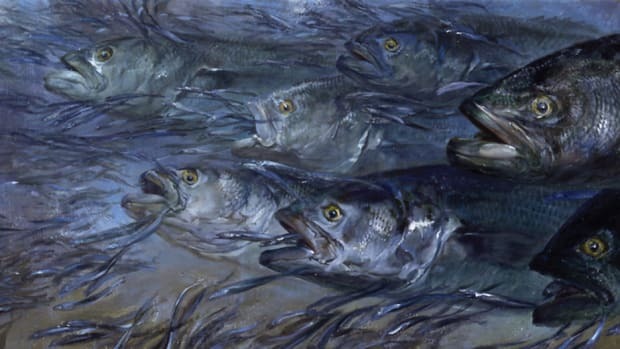 Blues spawn offshore in spring and summer, swarming up into mega-schools and releasing mind-boggling clouds of eggs to ride ocean currents inshore, where they hatch and begin the lifelong feed. I normally travel great semantic distances to avoid the term “cyclical” in fisheries discussions — the word has been stretched past its snapping point in our ceaseless effort to dodge responsibility for hammering key stocks — but there’s no avoiding the concept with bluefish. The species is known to be highly cyclical in terms of spatial distribution and abundance on various scales. A pinpoint area that’s positively rotten with bluefish one season may run dry for a season or five for no biologically apparent reason, then get swarmed anew. Sometimes bluefish will effectively disappear from entire regions without warning. 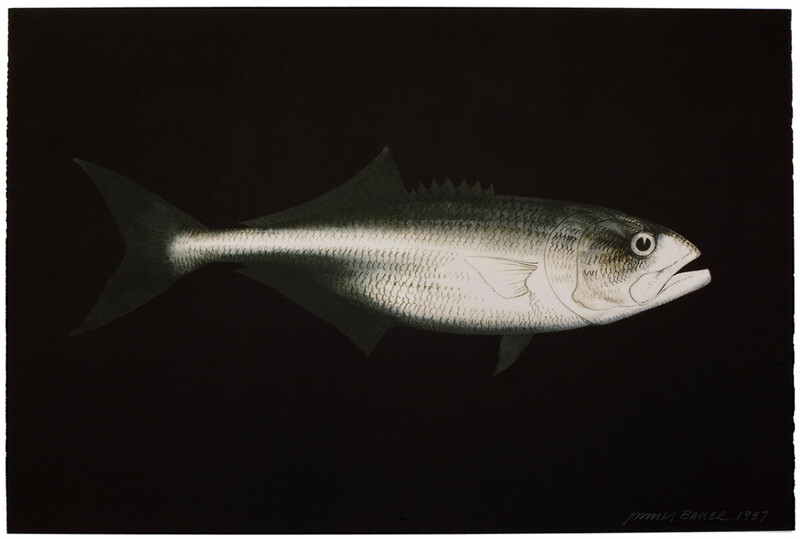 One of Jim Baker’s series of bluefish drawings on blackened backgrounds, where the skin has the look of beaten metal. 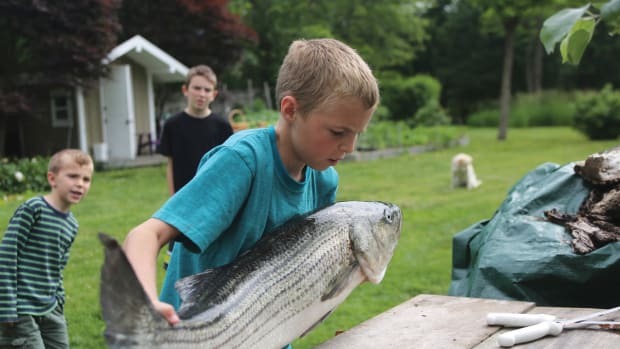 With the striped bass resurgence that began in the mid-1990s, a new generation of self-styled striper specialists witnessed a stretch of seasons when bass became so abundant that they filled in on all the traditional grounds, then spilled over into areas they’d seldom occupied prior to the moratorium. 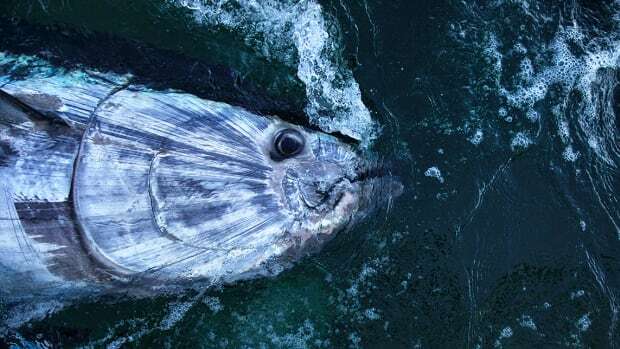 Charter captains were filling fishboxes with striper limits, and the bluefish that had in large part carried them through the moratorium became unnecessary — “nuisance” fish that clients were forced to retrieve between “real” fish. Charter captains and crews began to model a new disdain for blues, reinforcing to their clientele that bass were the only fish worth targeting. When you put live bait in waters containing blues and stripers, you’ll generally find the bluefish first. And these swarm feeders will make short work of an entire well of hard-to-find bunker or cooler of expensive eels. With unprecedented numbers of live-bait stripermen crowding the grounds, it doesn’t take a rocket scientist to understand the meteoric rise of old P. saltatrix on the angling public’s you-know-what list. Fast-forward 10 years. Sliding down the far side of stripermania, into a maelstrom of well-publicized stress factors and long-range doubts about the load-bearing capacity of the striper fishery, we’re headed for a reckoning. 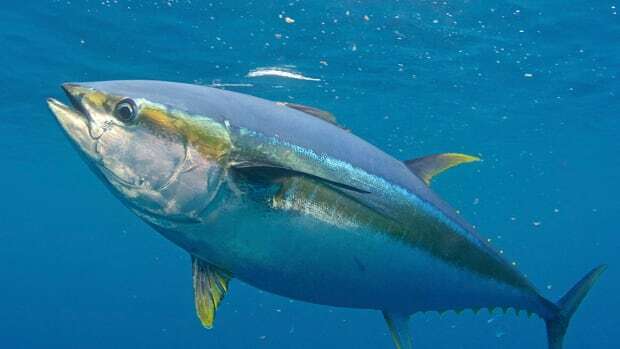 Let’s face it: If the goal of fishing is sport and not meat, then bluefish have to come close to game-fish perfection. Blues fight harder on a pound-per-pound basis than striped bass, are more cooperative under most conditions and have proved considerably more resilient, given their much faster growth rates and greater adaptability (from a habitat standpoint) than stripers. 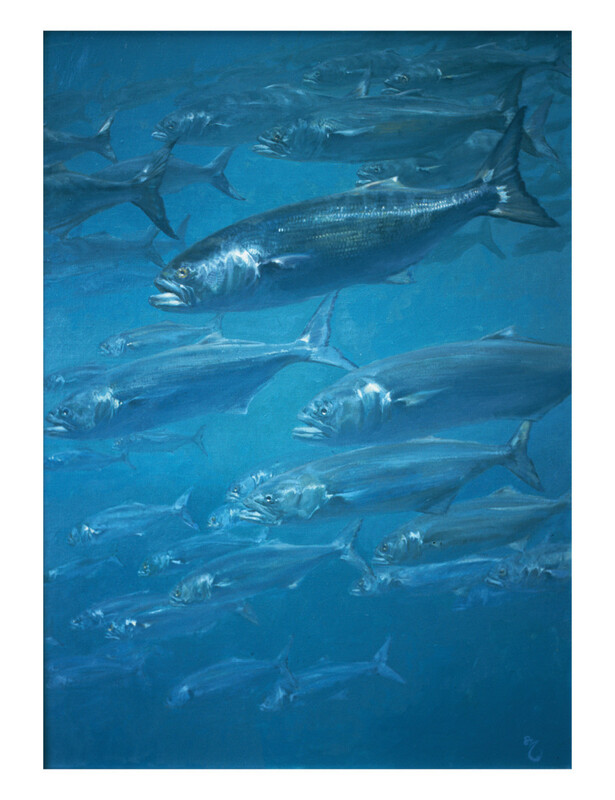 “The pattern of dullish silver sweeping through the water at great speed is a stirring event,” said painter Meltzoff, who spent a summer diving on bluefish, which led to this work, Shoaling Blues. Obviously, the goal is to ensure there will be striped bass mixed with bluefish as we move forward. But as much time and energy as we all spend fretting over bass, we owe it to ourselves as a fishing community to do some serious soul-searching over the way we treat bluefish. If not for the blues themselves, we owe it to our daughters and grandsons and great-grandsons who last year kicked off fishing careers from New Jersey to Massachusetts casting snapper poppers and spoons into high-summer harbors, bending their first rods on 4-inch and foot-long blues. Perhaps when the next angling year-classes make their first independent forays into fishing it will be the call of the “slammer” that ultimately sets the hook — the bleary-eyed quest to catch a bluefish over 15 pounds; driving down each side street that ends in water; a nor’easter brewing and the ink still wet on their driver’s licenses; and finally stumbling into a full-blown blitz. I launched my lifelong fishing passion and a near 20-year foray into my avocation on the promise of bluefish. Thousands of choppers later, I sat half-breathless, beaming at my good fortune, blood pouring from one elbow. 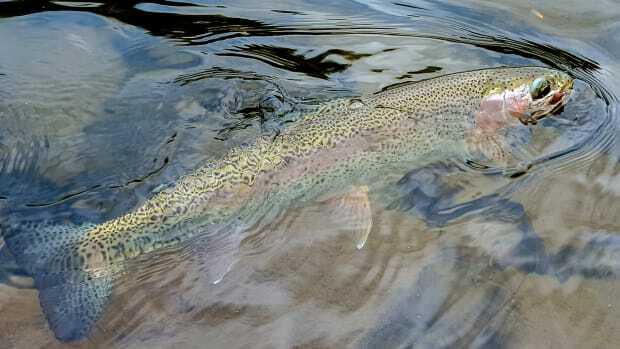 As I admired my 18-pound slammer of slammers, I swore I felt the shadow of my seventh-grade self tugging at my sleeve and firing off a battery of wide-eyed questions as he peered into the gravelly shallows at one hell of a fish. In the end, I don’t need my fish to be inordinately noble, storied or legendary; overly broom-tailed or broad-shouldered; or wily or cunning or built for the rigors of some specific watery habitat. I don’t need it to exceed some preordained weight or measurement. Maybe that’s the thing: I’m not fishing for the thrill of the artifice, the take, the awards banquet. 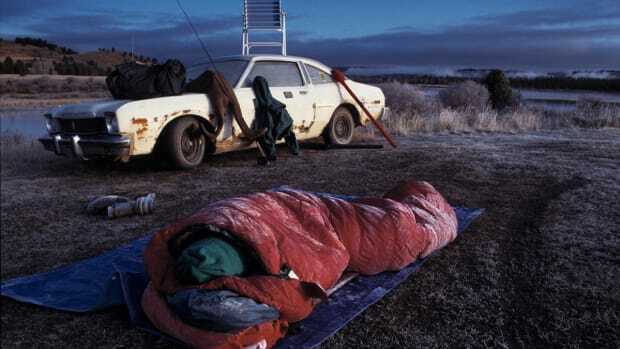 I fish for an excuse to stand alone in the elements and because part of the fragile balance I’ve struck with modern living is a gut-level need to connect with something as real, as “non-virtual,” as wild as the food chain. And no other fish in my home waters can out-wild a blue. The evening began like a fishing daydream. The sun was dropping. The flooding tide and a cool wind were roughly aligned. The author took a day off last May and went on an 11-hour, 120-mile, three-stream fishing marathon.